Two-time record setting champion Lewis Hamilton won his fourth Formula One Grand Prix since the start of the season. Seven races in, Hamilton has turned in nothing short of excellent drives for the Mercedes AMG team giving them a comfortable lead towards their second, Team Constructors Championship. Crossing the finish line second was Nico Rosberg, to complete a Mercedes one-two, Valtteri Bottas with Williams-Martini third, Kimi Raikkonen and Sebastian Vettel both with Ferrari fourth and fifth, respectively. Vettel started in 18th because he received a red flag infraction grid penalty, but skillfully worked his way up to, fifth. Rounding out the action on the track and in the points were, sixth place Felipe Massa who started 15th, Lotus driver Pastor Maldonado in his best showing in the last two years coming in seventh, Force India’s Nico Hulkenberg, Red Bull Daniil Kvyat, and Frenchman Romain Grosjean who qualified fifth, finished tenth. 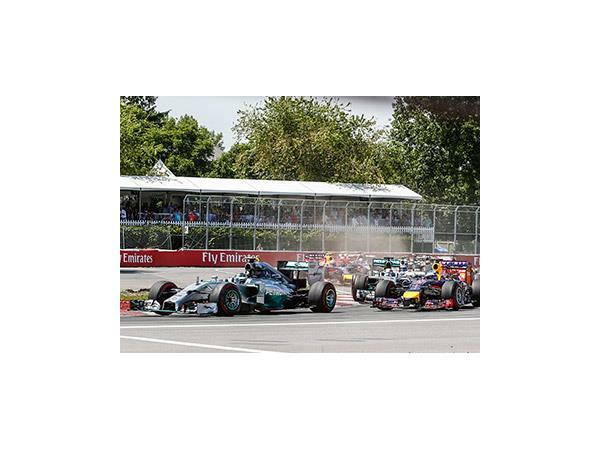 Pole sitter, Lewis Hamilton, got off to a great start in the Formula One Grand Prix in Canada at, Circuit Gilles Villeneuve, a street circuit on the city's Ile Notre-Dame. His Mercedes teammate Nico Rosberg had to fight for second at the starting line with Ferrari driver Kimi Raikkonen trying to squeeze him out. Rosberg held his position and Raikkonen fell in behind Rosberg at third. It was a bad day for the McLaren team when exhaust problems ended the race for Fernando Alonso, and shortly thereafter, a drive thru penalty on Jenson Button lead to his early retirement. Sauber’s Marcus Ericcson had a challenge for fourteenth with Max Verstappen finishing 15th and Sauber’s Felipe Nasr, was 16th. Stay tuned to Xiro Xone News and Sports. Next Race, Austria.